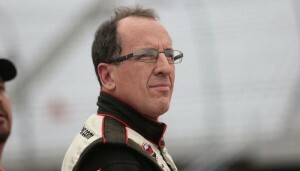 STAFFORD – On June 5 Ted Christopher turns 59 years old. Friday at Stafford Motor Speedway the track’s all-time winningest driver proved once again that age is not slowing him one bit. Or taking away his flair for the dramatics either. Christopher used a last corner pass to get by Keith Rocco and win the 40-lap NASCAR Whelen All-American Series SK Modified feature Friday at Stafford Motor Speedway. Rocco, of Wallingford, held on for second and Ronnie Williams of Tolland was third. It was the 104th career SK Modified victory at Stafford for Christopher and his 126th victory overall at the track dating back to 1986. Adorned with a hard hat in victory lane, Christopher joked about his late race battle for the top spot with Rocco. On lap 30 Rocco took a peek under Christopher in a bid for the lead. After preying on Christopher’s bumper lap after lap, Rocco used a diving move under Christopher to wrestle the lead away on lap 37 in turn three. On lap 38 Christopher looked under Rocco in turn two, but pulled back behind him. On the final lap Christopher went diving into turn three under Rocco and came out of turn four back in the top spot. Alright maybe I should stop slobbering with such glee at the SK and SK Light car counts, incredibly loaded fields of talent and competition but really these are good times to see the modifieds at Staffford. Sure I was there for the Evans, Polverari, Cookman, Ruggiero etc racing and it was epic. The competition in this version of modified racing is better. Great clean battle with the 13 & 88, the 49 wasn’t far behind. Good car counts in the sk lights. Anyone see the squirrel run onto the track at the start of the first sk heat? Well said, Doug. Great racing. One more thing; Let us see the SK Lites for 25 or 30 laps. The fans are getting robbed! Can you imagine. TC has 126 wins at one track. Most people don’t even come close to that in their entire racing career. I haven’t been a big Ted Christopher fan mainly because a few of my race buddies are card carrying TC Super Fans that think he can do no wrong. So I had to counterbalance their unwavering support, point out some of his more aggressive moves and temper their enthusiasm. The year he won the national title by winning almost every SK race at Thompson was pretty impressive but made me root for anyone but TC. Maybe it’s his longevity, the fact he usually runs multiple tracks weekly, or because he isn’t as dominant as he once was, but now I find myself rooting for him more often than not. It will be interesting to see where he ends up for all time victories when it is all said and done. I think it will be a number that likely will not be broken. I thought Ryan Preece was running Stafford weekly. Does anyone know why he was not there? Ryan got married this weekend. GBIII was in the 6 at Langley. ( hurry back Ryan LOL) I always had Teddy in the Dale Earnhardt category. A fast wheel man that is easy to hate because he drives like an arse way more than he needs to. I’m sure he loves to beat Rocco and he’s shown he can still get up on the wheel when he has to. He can still be Teddy as well as anybody saw at Bemers Big Show last year. Not a fan here but 3 cheers to the “old” fart. Go ahead a root for one or two of your favorites. We all have them. I’m rooting for the entire mass of SK cars, lights included. You design a feeder division to use the older equipment of top modifieds, to develop drivers and provide competitive racing. Very rarely has that been so well accomplished then with the modifieds. The result is a loaded and highly competitive SK division. So loaded that top former, very successful Light drivers have a good night if they crack the top 10. So loaded that any one of 10 guys can win on any given night. Christopher has made his name and that’s fine. What you want is a flow of young talent on the rise and at Stafford it’s flowing like crazy and the racing never better in the modifieds anyway. Seeing as how Chase Dowling won the first race jeffrey congratulations for setting a new world record for being wrong as soon as you typed the prediction. And when you make up a story you might want to avoid saying you heard and that you were there in the same entry. The town meeting minutes and resolutions are published by the way for all to see. Two races into the season. Two SKL victories for Cory DiMatteo. Zero articles. Why? Pretty sure if the 87 was winning we would see articles. Doug I was there for all those 30 Lap Friday night races, the difference then was the talent was stacked 12 15 deep an those were the best modified drivers ever, Evans, Flemke, the Bouchards, Bodine, Ray Miller, Cookman, Reggie, Rosati and so many more to name. I will agree that Stafford has it’s share of talent and without a doubt they put on the best show around but you cant compare today’s drivers to those guys it’s not even close. As I’m sure you are aware, once the features get going they go from one to the next without breaks. To leave the press box and go to the pits and find the winner of any particular event means missing a good part or all of the next event. And for that reason, a long time ago (before I started covering events there in 1995), Stafford Motor Speedway management instituted a rule that all race winners go to the press box immediately after their events. Then reporters covering the events and the track public relations person can speak with those winners and not be forced to miss a huge portion of another feature to search them out in the pits. Drivers are told fairly regularly at driver’s meetings about this rule and most do honor it. Some choose not to. I can’t personally force drivers to come to the press box. The winner of the SK Light Modified feature didn’t come to the press box Friday night. That’s his choice. The other winners Friday night chose to go to the press box after their events. Again, I can’t personally force anyone to do anything, but at the same time, if you decide that you don’t have the time or desire to go to the press box or you think people should seek you out, then chances are there won’t be a headline. And also, the 87 has come to the press box after every win he’s ever had. As a matter of fact I can’t remember a single SK Light Modified winner from last year at Stafford that didn’t come to the press box after a win. Tell you what Jerry we’ll agree to disagree. Sure those days were iconic times with powerful cars. great drivers and incredibly loyal fans. I’m not talking comparing that to now All I’m talking about is competition. Go ahead and watch those races on youtube.They are simply not as competitive. There is absolutely no doubt that right now we get more races for the lead then ever before. And we have a feeder division in the Lights that has never been stronger then now. And Shawn that inside information on covering the races is outstanding. Keep it coming. Also he is running selected weekly events not all of them. But he did get married this past weekend so congrats Ryan on that. Doug, I agree that there is a lot of competition today but at Stafford today the drivers don’t have to pass many cars compared to before.. back in the day the top cars started just in front of the consi cars for the feature, today they start very close to the front, in front of drivers below top 15 in points. There was a rule that a feature winner could not start in the first three rows. Usually the winner didn’t crack the top 10 till halfway, today. The winner is in the top 5 by lap 10. Also 25 years ago there was 20 sk’s in each consi. At one time they paid $300 to win the 21 lap consi with 🏆. Steve, I don’t believe the handicapping has changed all that much but maybe some expert can chime in with an informed observation. I do know there were 6 feature winners last year in the SK’s with Pennick winning six I think. My recollection is he earned them starting deep in the field. And the rest of your remembrances seem to be told with a far off look in your eyes through rose colored glasses. And I support that. New nickname for Steve: “Stuck in the Past Stevo”. Steve knows all about the consi. Im sure his cars were there all through the 80’s and 90’s. If he decides to show up at Stafford again he will once again be in the consi and will miss the show. Go Stevo! Last I checked, handicapping of QUALIFIED cars (based on car count, number of heats, etc) is based on $ won last 3 weeks, with feature winner not allowed to start any higher than 12th. Non-qualified cars start after all qualified cars are handicapped, again on $ won order. The past few years the handicap system has worked this way – out of the cars that qualify through the heats, the top 15 in points are handicapped. Everyone outside the top 15 in points start behind those cars regardless of how you do in the heats. A feature winner can start no better than 5th, unless there are a whole bunch of different winners, then circumstances dictate that a previous winner might start in the front 2 rows. Back in the day, it used to be 3 heats per division, and 7 qualified. All 21 of those cars were handicapped, using the same formula of money won the past 3 weeks. If you took a week off you were charged with a win plus $1 on your handicap.Jjust like now, a previous feature winner couldn’t start better than 5th. It was normal back then for the hot shoes to start 15th to 20th every week. Nothing would get done if not for the last corner.